Ray Celestin lives in London. He studied Asian art and languages at university and is a script writer for film and TV, as well as publishing several short stories. THE AXEMAN'S JAZZ is his first novel. My debut novel, The Axeman’s Jazz was published this May (2014). It’s a noir-inspired detective novel about a series of real life killings that took place in New Orleans in 1919. Two of the book’s three protagonists work as private detectives, and the story was influenced (as are many first detective novels, no doubt) by the works of Arthur Conan Doyle. The influence is quite clear as Ida, the heroine of the story, is a Sherlock Holmes fan herself, who becomes interested in being a private investigator through reading the Holmes stories and even quotes from Conan Doyle’s books on occasion. Holmes is seen as the archetypal detective, probably because he was the first detective to really grab the imagination of the public and thus in some ways he became the archetype. Charles Dickens, Wilkie Collins and Edgar Allan Poe all wrote notable stories featuring detectives that predate Conan Doyle, but it is Conan Doyle’s creation that is still current and remembered. However, many of the tropes that existed in the original stories do not really feature much in later adaptations, and as each adaptation leaves its mark on the character an opposite process has also occurred - much of what we now consider to be Holmesian is not in the original stories. This is process of changing the source material doesn’t begin in any of the adaptations, but in the artwork that accompanied the narratives when they were first published in magazine form. 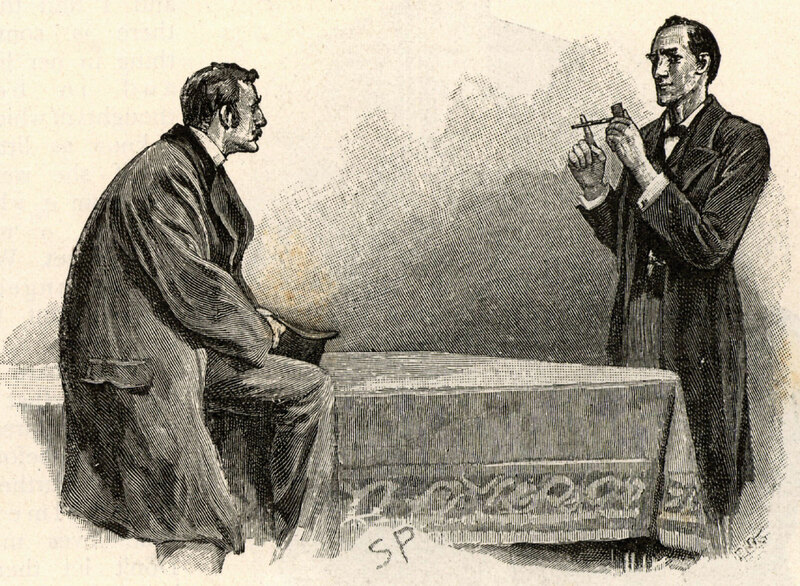 The illustrator Sidney Paget was originally hired to provide sketches for the Holmes stories after The Strand Magazine accidently sent him the job offer (the intended recipient was Paget’s younger brother, Walter, also an illustrator). Conan Doyle thought Paget’s illustrations made Holmes too good-looking and that the detective should look a little more manic (as he is described in the stories). Paget was however, responsible for giving Holmes his deerstalker hat, an accessory that isn’t really mentioned by Conan Doyle. 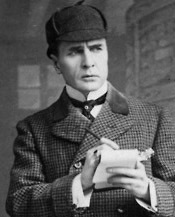 After Paget, the first hugely successful adaptations of the Holmes stories were on the stage, with the American actor William Gillette playing Holmes. The actor, (whose casting Conan Doyle very much approved of) was the first to give the character the large, curved pipe he later became associated with. In the books, no mention is really made of Holmes smoking a large-bowled pipe, and he just as often smoked cigarettes. Gillette also came up with a piece of dialogue that has a familiar ring to it, “Oh, this is elementary, my dear fellow”, which was subsequently turned into “Elementary, my dear Watson” by PG Wodehouse in his 1915 book, PSmith, Journalist. This is the first recorded usage of the phrase, which never appears in the original books. So within Conan Doyle’s own life time, Holmes had been given his characteristic looks, hat, pipe and catch phrase all by other people. This process of syncretism continues to the present day and is perhaps understandable given the number of adaptations that have occurred - according to the Guinness Book of World Records, Holmes is the most adapted character in history, with over 70 different actors playing him in various TV, film and stage adaptations. (My own personal favourite is Jeremy Brett). Holmes has been depicted as a delusional millionaire, a client of Freud, a drunken actor, an animated Japanese hound-dog, a Disney mouse, and as fighting against the Nazis, Jack the Ripper and Dracula. Perhaps this plethora of faces and forms is something the great detective might approve of, considering one of the tropes in the original books is that Sherlock Holmes, as well as being a master detective, was also a master of outrageous disguises.